The cosmetic effectiveness of the Nature in its purer form. 100% pure and natural. 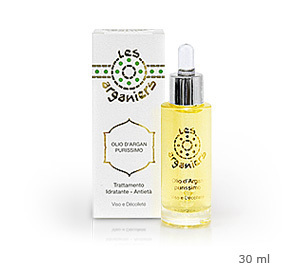 Thanks to the exceptional content of active substances, OMEGA 6, TOCOPHEROLS, PHITOSTEROLS, SQUALENE, the ARGAN OIL helps to reconstitute the hydrolipidic film favoring hydration and nourishment of the skin in depth, it helps to protect it from the external aggressions, to slow down the aging and revitalize the skin giving it brightness, elasticity and compactness. Pleasant in the application, it is of easy absorption and it doesn't anoint. Apply some drop of it in the morning massaging it alone or before the cream or the make up. The evening: apply abundantly as special treatment of beauty with delicate circularmassages on the skin perfectly cleansed. Results: INTENSE HYDRATION. The results are visible since the first application; the SKIN will appear More' COMPACT, ELASTIC and BRIGHT. In the HAMMAM treatment it is applied with a massage after the purification with the RHASSOUL MASK.